We have received a number of requests to create a guide to adding your own images and creating submats with Digital Talking Mats and this blog will show you how. One of the features of Talking Mats is that we have developed a number of different symbol resources based on our research and clinical practice which cover a wide range of topics. However, sometimes you may want to personalise what is being communicated about by adding your own images. You may also want to create a submat to explore an existing topic in more detail or you may want to create a completely new topic. In our training courses we explain how to do this when using the original Talking Mats. However more and more people are now using the digital version of Talking Mats. 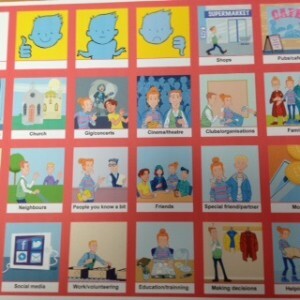 In a previous blog we described how to add your own photos to the Digital Talking Mats. We have now made a guide to help those who have the digital version to both add their own images and to create a submat with an example of a sub-mat with the topic “office”. This entry was posted in App, Blog, Digital Talking Mats, Personalisation, symbols and tagged digital, Personalisation, Talking Mats on November 25, 2016 by Joan Murphy. 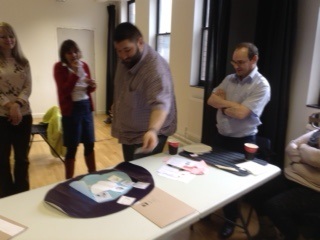 In adapting the foundation Talking Mats course we learnt lots! Here is a summary of key learning. That we had a great group of people who were keen to learn and develop their communication practice to become Talking Mats interviewers, or as we call them in Talking Mats ‘the listener’ ( as they are listening to someone’s views). They appeared to really enjoy the learning experience and were enthusiastic, embracing all tasks including making a video of themselves using Talking Mats with someone in their organisation. In Talking Mats we call the person doing the mat ‘the thinker’. That movement helped learning. It was good to design activities with some potential for movement so that people were not sitting too long and that they could get up and stretch. For example, on the Talking Mats foundation course there is an activity that thinks about abstract and concrete language. We adapted this by using cut out coloured circles and got participants to think about the language load of a particular concept and place the symbol concept in the relevant circle. That Talking Mats empowers both the thinker and the listener. It gives a structure to make a conversation flow. The training itself not only gave the NIN members who attended a tool to communicate with others about how they feel, but also seems to have had a positive knock on effect on their confidence and we hope that continues. We are incredibly proud of our cohort of trained Talking Mats listeners. 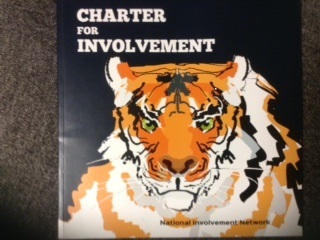 As part of the project they have been interviewing other service users in their organisations about 2 aspects of the Charter for Involvement –‘independence’ and ‘being involved in their community’ – ( 2 abstract concepts, as the NIN listeners will tell you). Not only has this included more people in service evaluation but has led to making changes that are improving lives. One man who everyone thought was doing really well living on his own expressed a view that he was feeling lonely, He is now being supported to identify if there are enough people interested to start a local group. The project is still ongoing and the full report will be available from ARC Scotland in 2017. This entry was posted in Blog, Learning disability, Participation, Training and tagged Learning Disability, Participation, Talking Mats on November 18, 2016 by Lois Cameron. Statement 3 –We must be involved in our communities. Organisations from a wide range of settings sign up to the Charter and commit to ensure their services put the statements into practice, as they are relevant to people everywhere. ARC Scotland is the organisation that supports the work of the NIN. At a Scottish Government Keys to Life event at the Scottish Parliament James Fletcher Director of ARC Scotland and Lois got talking about how we could help services reflect on the extent they were meeting the Charter aims from the perspective of people who need extra support with communication, and the seeds of this project were sown. Feedback was it can be difficult for organisations to support the people who use their services to become truly connected and involved in the local community . In addition there can be a tension about supporting people to be more independent and autonomous when we live in a risk averse service culture. Could we develop a Talking mat that would allow members of the NIN to explore statements 2 and 3 of the Charter . What aspects of living independently and being involved in their community were going well for them and what aspects were not going so well? 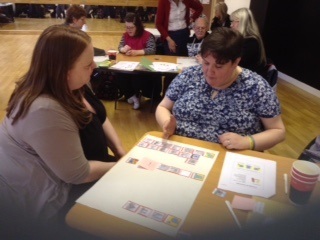 Keys to Life was recognising the importance of social connectedness and the subsequent ARC application for money to do this in partnership with Talking Mats was successful . It was recognised from the outset that there would be some people with a learning disability who would not be able to respond to the more abstract Talking Mat. The Charter for Involvement has its own design and style and therefore it was agreed that The Talking Mat would fit into its brand and that we would work with their artist. The Talking Mats are called Taking Part (1 for the more concrete mat ) and Taking Part (2 for the more abstract) Once the Mat was created the training with Nin Members could commence but that is for another blog! This entry was posted in Learning disability, Participation and tagged Learning Disability, Participation on November 11, 2016 by Lois Cameron.